Looking to make amends for not having A Link to the Past come in a golden cartridge, Nintendo recently sent out a press release via carrier pigeon to all the feudal lords to discuss their plans to use metric tons of gold paint on the upcoming Skyward Sword. And they give pricing and release details! 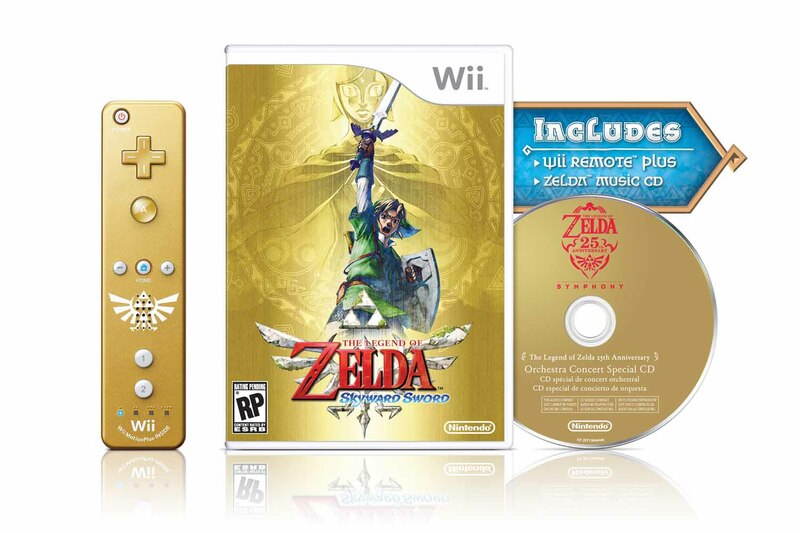 As you might be able to see from the image, there is a “special limited edition” of the game that comes with a shiny golden Wii Remote Plus (the fancy kind with the gizmo built right in) and a CD that includes orchestrated tracks that “will be performed at The Legend of Zelda 25th Anniversary Symphony Concert,” whenever that is. If you don’t want/need the controller (a Wii Remote+ will be required to play, FYI), this CD luckily will be included with all of the first run copies of the game. The special edition will retail for $69.99 and the normal, you-don’t-get-a-controller version for $49.99. The game will release on November 20, which is definitely a Sunday. Let’s just hope all that gold doesn’t rub off and get into your bloodstream.